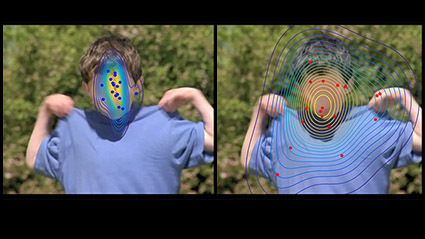 Each dot represents the gaze position for an individual child watching the movie. The blue dots on the left represent the typically developing toddlers. The red dots represent toddlers with Autism Spectrum Disorders (ASD). The face wasn’t blurred during the experiment. Scientists from UNIGE have unpicked early changes in the brain that govern how toddlers with autism respond to social cues. Their research may open the way to new therapeutic interventions at early stages, when neural plasticity is still possible. As infants develop, they preferentially move towards and respond to social cues – such as voices, faces and human gestures. At the same time, their brain develops a network of regions that specialise in translating these cues, known as the ‘social brain’. However, a common observation in infants later diagnosed with Autism Spectrum Disorders (ASD) is reduced sensitivity and attention towards these social cues during the first year of life. This apparent indifference to social cues is thought to ultimately hinder the normal development of the social brain at early developmental stages. A team of researchers from the University of Geneva (UNIGE), Switzerland, now brings direct evidence of this hindered development during the toddler to pre-school years in autism. Their findings are published in the journal eLife. The team used an electrophysiological monitoring method called electroencephalography (EEG) to study the children’s brain activity, and powerful eye-tracking technology to observe their gaze while they watched movies featuring human social interactions. They found that the children with ASD had different gaze patterns while watching the movies to the typically developing infants, and that this was accompanied by alterations in nerve cell connectivity and information flow in the brain. In those with ASD, the team also observed what is known as ‘increased driving’ in two specific frequencies of brain waves – alpha and theta – as well as high levels of connectivity between nerve cells in certain regions in the brain. The theta brain wave frequency and the regions of the brain affected are both known to be important components of the ‘social brain’, and the alpha frequency is important for visual attention. These findings represent the first evidence that differences in the visual exploration of images coincide with changes in connectivity between key regions of the social brain in very young children with ASD. Brain regions generating these brain wave frequencies may therefore develop differently in children with ASD compared with their typically developing peers. Early alterations of social brain networks in young children with autism.